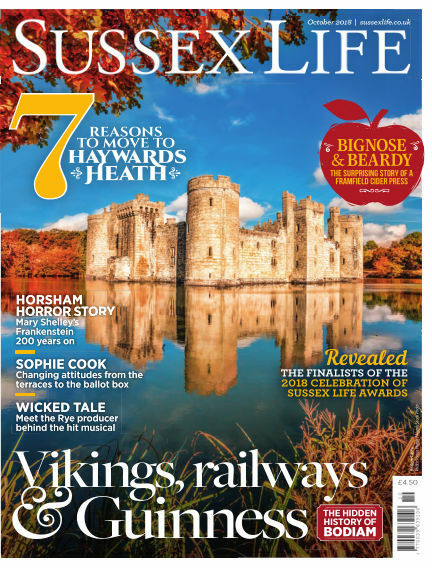 In this issue of Sussex Life : - Vikings, Railways & Guinness The Hidden History of Bodiam. - 7 Reasons to move to Haywards Heath. - HORSHAM HORROR STORY Mary Shelley’s Frankenstein 200 years on. - SOPHIE COOK Changing attitudes from the terraces to the ballot box. - WICKED TALE Meet the Rye producer behind the hit musical. - BIGNOSE & BEARDY THE SURPRISING STORY OF A FRAMFIELD CIDER PRESS. - Revealed THE FINALISTS OF THE 2018 CELEBRATION OF SUSSEX LIFE AWARDS. With Readly you can read Sussex Life (issue October 2018) and thousands of other magazines on your tablet and smartphone. Get access to all with just one subscription. New releases and back issues – all included.